Hi everyone. We spent much of our free time this week at the new house, mostly removing carpet and preparing the floors for refinishing. But inbetween the work, we still managed to get out to a few thrifts. 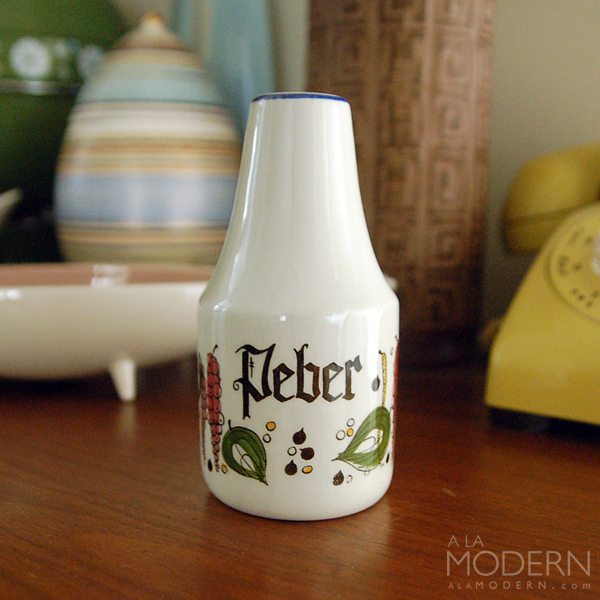 This little pepper shaker caught my eye, and it turns out it's a popular pattern called "Pernille", made by Knabstrup in Denmark. I actually found the salt shaker too, but it had been cracked so it got left behind. They made a whole assortment of different containers and canisters, some of which are quite collectible. I've been passing on Vera Neumann scarves lately, due to damage and the fact that they don't seem to sell as well for us. Actually, the worst part is that the thrifts near us STAPLE the tags onto the delicate fabrics. This is just idiotic. And not only that, but they use the heavy duty staples, not normal office ones! 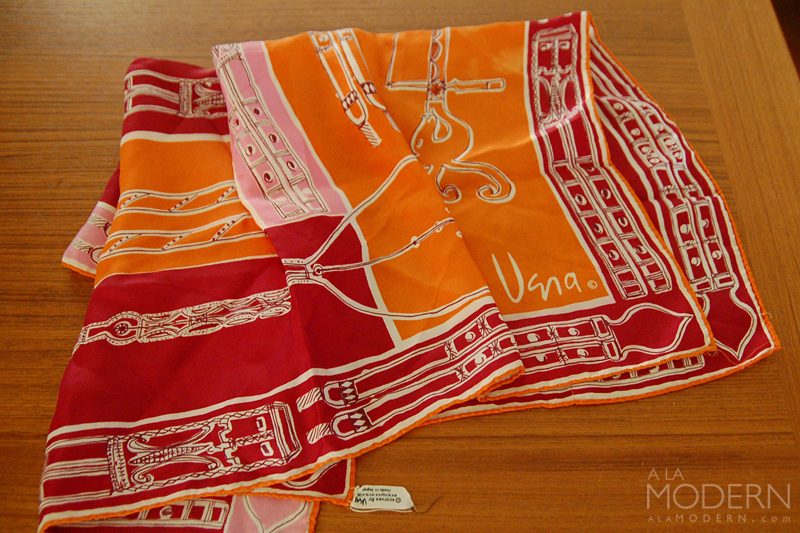 I still had to pick up this particular Vera scarf, because it had interesting musical instruments on it. At the same thrift, I found more Vera Neuman - this time one of her patterns on Mikasa bone china. 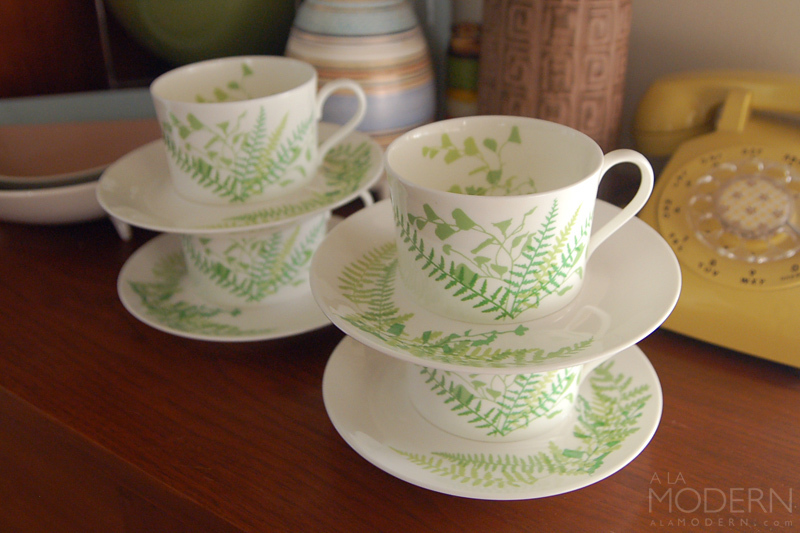 This is a wonderful green plant design called "Lacy Fern" - the coolest thing is that the cups have a partial design on the inside. I also got the creamer, but left the sugar because it had too much damage. 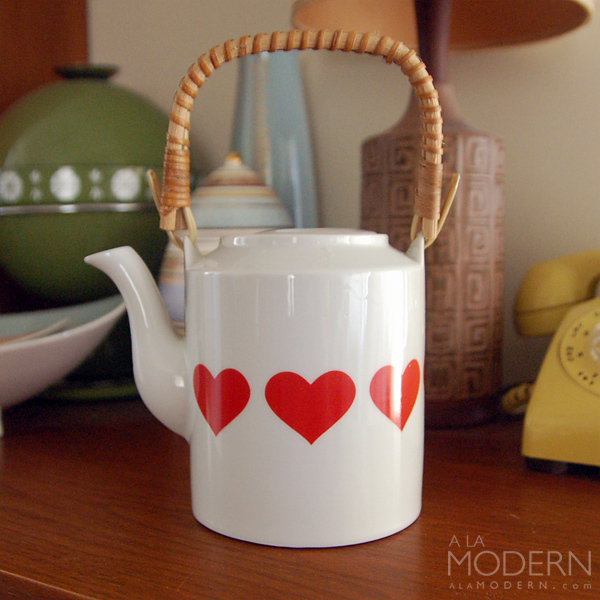 This nice little "Hearts" teapot is an example of a pickup that has no special designer or manufacturer attached to it - but I knew it would be popular in our Etsy outlet. It's not Kaj Franck, but seems like it would go along nicely with those enamel bowls. I know, I know - you're seeing double here! 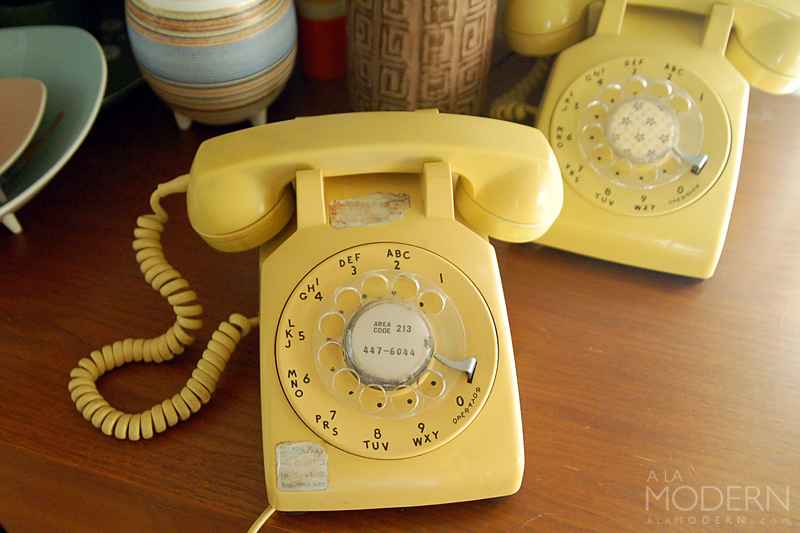 This yellow Western Electric 500 phone is a twin of the one that appears in nearly all of our product photos. I guess I shouldn't have bought it, especially since the house we're moving to will not have a landline for it to connect to! But it was so cheap at an estate sale that we visited that I couldn't resist. I had to un-wire it from the house actually - it was wired right into an old school phone jack. I really like to disassemble, clean and repair these type of phones. Many times, they are sold as "broken" when it's a rather easy fix to make it ring again. 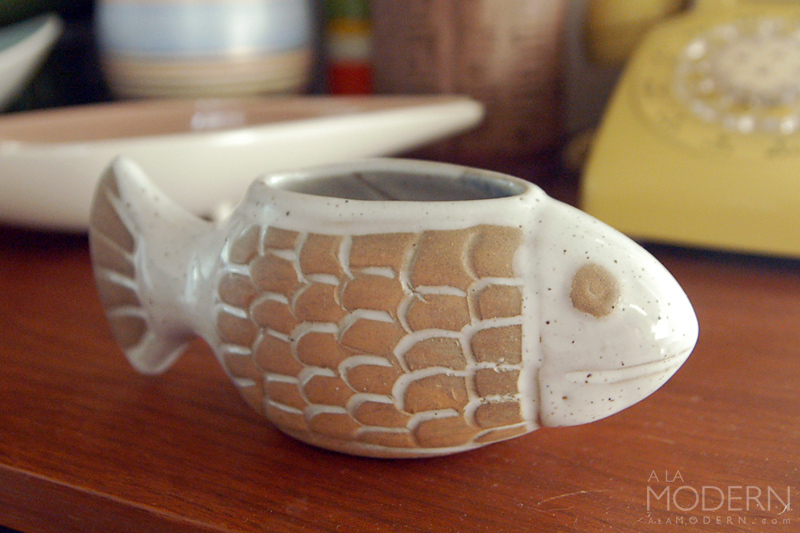 I haven't come across too many David Stewart for Lions Valley items lately, so was happy to find this little fish planter. Interesting that this item is pre-drilled. We actually own this identical fish already, and that one doesn't have a drilled hole. Since we already have this fish, I think this is going up in the shop. 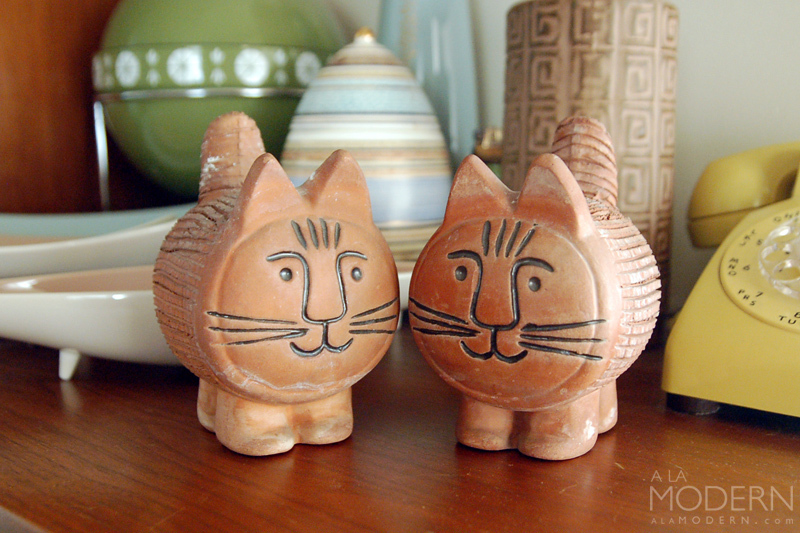 Still, I was very pleased to pick up these Lisa Larson style Chia Pet planters. Yes, I know they aren't Lisa Larson - even though Ebay sellers often try to sell them as such. The face pattern is remarkably similar, but the body is definitely different. I'm really surprised that the Chia Pet makers copied it so directly. I haven't been able to find out if these are still sold or not, though I think they're from awhile back. 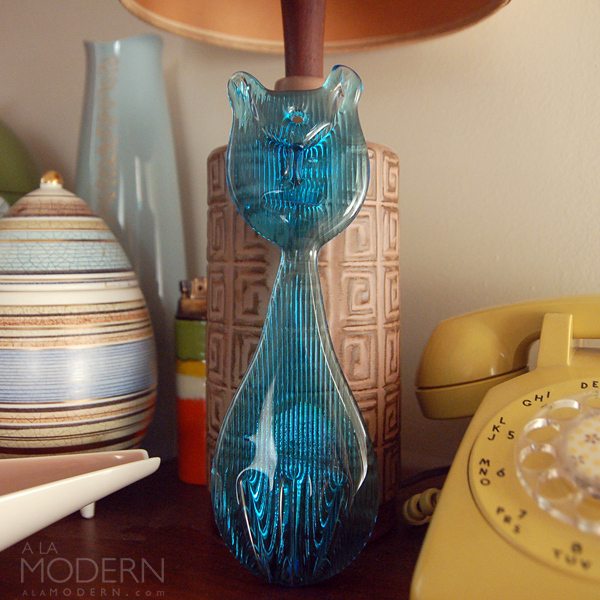 OK - hope you enjoyed this week's thrift roundup!